About a quarter of all homeless people in the United States live in California, nearly 130,000 on any given day. California also has the highest rate of unsheltered homeless individuals in the nation: 70%. Does lack of veterinary services in Los Angeles County homeless shelters provide a barrier to entry in California? While homeless people with pets reported fewer symptoms of depression and loneliness, having an animal makes it more difficult to stay in a shelter. Sometimes there aren’t enough beds to go around and people forgo their beds if the shelter prohibits its members from keeping their pets. Forty-one shelters in Los Angeles County allow pets conditional on documentation that shows the pets are support animals or that their vaccinations are up-to-date. The other 113 shelters don’t allow them period. Up to 10% of the state’s homeless population have pets according to Pet’s of the Homeless, a nonprofit organization. If California state Senator Robert Hertzberg’s proposal, SB 258, passes, the state will increase veterinary service spending by $5 million for homeless shelters. The proposed bill would provide food and basic care for residents of the shelter. A homeless shelter in Sacramento has experimented with the idea. Front Street Animal Shelter opened a pet-friendly facility in December 2017 to help homeless residents who did not want to feel that they were abandoning their pets. Their employees vaccinated and fed 10,215 pets in 2018, at a cost of roughly $50,000. However, the return on investment via benefits to the physical and mental health of the homeless and their animals is difficult to quantify. One potential benefit lies in encouraging homeless people with pets to use shelters when in need. To determine whether allowing pets increases uptake, we analyzed data from 157 shelters in LA County, of which forty-one allow pets. We looked at utilization rates to see if we could detect a difference between homeless shelters with and without veterinary services. After regressing veterinary services on the utilization rate of all homeless shelters in Los Angeles County, we found that providing veterinary services had a strong, statistically significant impact on the utilization rate of homeless shelters in Los Angeles County. Shelters in LA County that provide veterinary services have 21% higher utilization rates. Hertzberg is attempting to “find something with an immediate impact” on the California homeless epidemic, and providing veterinary services is a potential solution. The data indicates that average utilization rates are higher in shelters that allow pets. This suggests that the homeless do value these veterinary services. Moreover, as the figure shows, shelters with vet services are operating at capacity more frequently than those without such services suggesting that homeless with pets more frequently suffer from lack of openings. One word of caution: the causality could run the other way, with shelters in high demand for other reasons having added vet services. We should also note that opportunities to expand may be limited as many Los Angeles County shelters lack the infrastructure necessary to care for the pets of the homeless population. Nonetheless, our results show that, provided shelters have the physical capacity, the funds from SB258 would have a large impact on the homeless in California by relieving them of having to choose between shelter and animal companionship. 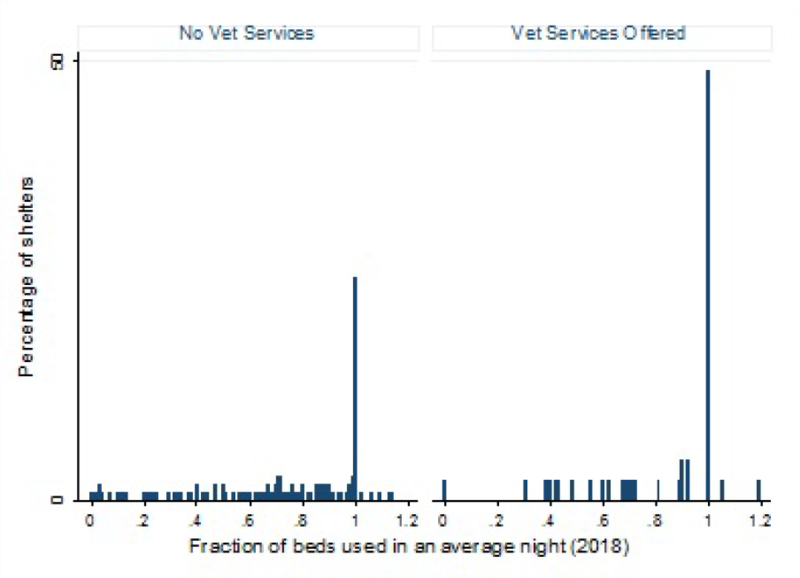 Figure: these histograms of average utilization rates for 2018 show that shelters offering vet services (right) are far more likely to be operating at or above capacity than those without such services. As the figure shows, many homeless shelters are already at or over stated capacity. Thus the data are right-censored and we use a Tobit regression to account for this upper limit on expressed demand.